You have probably already heard that the AE token is now supported by the Ledger Nano S hardware wallet. This enables yet another secure way to store your AE tokens in addition to the AirGap option. Creating an æternity account in Ledger is actually quite easy. You will just need to install the æternity app on your hardware wallet using the Ledger Live software and then go to base.aepps.com to create an account. We have prepared a simple step-by-step guide on how to do that. Despite our efforts to try to make this process as simple as possible, we have still noticed a number of users that seem to be experiencing difficulties setting up and using the Ledger for AE token management. Participants will create a video explaining how to install the æternity app using Ledger Live. 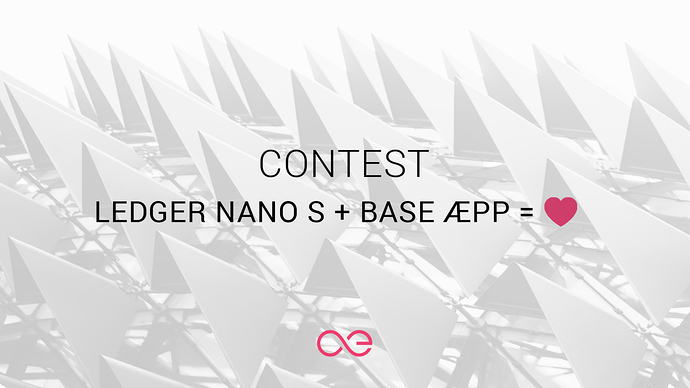 Once installed, they will need to show how it is recognized by the Base æpp in-browser (Chrome or Brave) and create an æternity account. The video must also feature receiving a transaction in AE tokens within the account generated on the Ledger, and then making a transaction using the Ledger and the Base æpp. The video must be recorded in clearly understandable English. If possible, please show the prompts on the Ledger Nano S screen. At the very least, explain what the Ledger Nano S displays and how you are interacting with the device. If you need a very small amount of AE tokens to create the guide, request it below. Please announce your intention to create a guide below and include your AE token account. Once the guide is ready, please edit the post to include a link to the video. If you are selected as the winner, you will need to provide the original video file to us, so we can upload it to the æternity YouTube channel. Credits will be given. In addition to creditting you as the guide creator, you will also receive 100 AE tokens (Mainnet, of course). If you are not selected as the winner, but have still prepared a guide, you may receive some AE for your efforts. Video submission deadline is 31.01.2019. We are excited to see your videos and we wish you all good luck! Don’t forget today is the last day to participate in our contest! We need your help to demonstrate how easy it is to store your AE tokens on Ledger. Make a video to demonstrate how Ledger Nano S works with æternity’s Base æpp and you may be rewarded!!! Since the contest ended yesterday and there was a single entry (by our friend @Drugzbymail AKA Josh) it is quite easy to select the winner Moreover, Josh did quite a good job with his video and followed all requirements. His video is indeed not perfect, but is easy to follow and will be helpful to users that are unsure about how exactly to use their Ledger devices with the Base aepp on a desktop. So, there you have it! Josh is the winner in this contest and will receive 100 AE tokens and our gratitude for his dedication. Thanks, man! Sure. If you are up for it Thanks!